Searching for a solution to correct the poor coordination between product delivery and the delayed receipt of electronic delivery notices, Nolte Küchen came across the internet protocol EDIINT AS2, the new communications module of i‑effect®, and solved it’s EDI problems. The second largest kitchen brand in Germany, whose roots go back to the 1930s, exports into 42 countries across the world. Kitchens are designed and built in Löhne, the „World City of Kitchens“ and 30 Km away in Melle, where supplemental components, such as, electrical appliances are delivered. To coordinate the combination of supplemental components and those built by Nolte, the distribution center in Melle is equipped with, what is considered, leading technology in Germany. 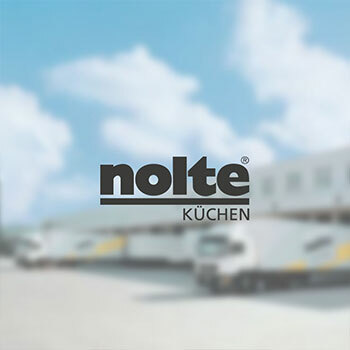 Nolte Küchen deals with 200 suppliers which include wellknown companies like Bosch and Siemens Appliances, Blum, Egger, Hettich and Kesseböhmer. Every Month about 1500 orders go out as EDIFACT and about 1000 as PDFs to their business partners. An order can comprise of up to 100 items. It is a troubling thought that trucks, which had short distances to travel, had to wait at the loading docks for advanced shipping notices to arrive. Herbert Czerwonka, the system administrator, holds the limited transmission capacity of Businessmail X.400 responsible, which was used to transfer, among other things, ORDERS, order confirmations, shipping, and payment notices with 25 partners. Nolte Küchen uses i‑effect®, in addition to the classical EDI-Workflow functions, in other areas of distribution. i‑effect® converts Spool order data into PDF documents using the i5 550, which is to be sent on to approximately 75 suppliers via Email. That is, incidentally, the only process that Czerwonka doesn’t allow i‑effect® to do automatically, because the dispatcher ships only after personal quality control and sometimes prints the PDF first when necessary. The module i‑effect® *DBEXPORT exports the production data directly from the DB2 and converts it into the editable formats TXT, XLS, or CSV, so that it can be edited and changed directly in a digital format by Nolte’s partners. The production data is retrievable as compressed by i‑effect® as ZIPs. Herbert Czerwonka can attest for the smooth operation i‑effect® and its predecessors. The initial implementation was fast and easy. menten took care of the unfinished mapping details quickly. The switch to i‑effect® and the upgrade to AS2 brought some typical adjustment problems with them. While i‑effect® didn’t accept the configuration data, a missing PTF from IBM caused a Telebox dialling problem with the acquisition of AS2. „We had to use a few tricks, to keep the processes going.“Czerwonka said. But since the initial obstacles were overcome, thanks to the prompt support form menten GmbH „everything runs well again“.